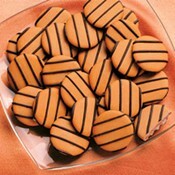 I love October because See's Candies has its special edition Orange and Dark Chocolate Wafers. These wafers are so tasty and have the best texture. They are very rich so you don't have to worry about eating the whole box in one sitting. If you don't have a See's Candies near you, order them here. I'm on my second box so far.